Who says accent walls are so last decade? Not me. I love how a carefully chosen wall or piece of architectural interest can be highlighted dramatically by color. Here we see how bold color creates a defined outside eating area with all the drama of an interior dining room. Why not! 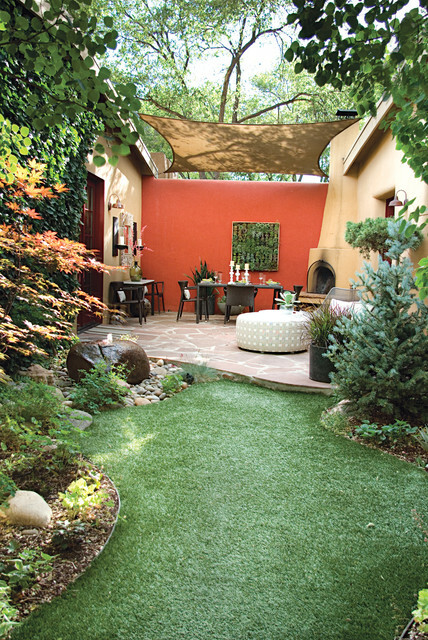 It’s okay to use accent color on the outside of the house to warm up a patio, jazz up a porch wall, or provide a colorful backdrop to a garden. It’s spring. Get out there and do some color! Which Came First? The house color or the foundation plantings? My guess? Neither. Take a close look at the roof, and the house color palette is revealed. 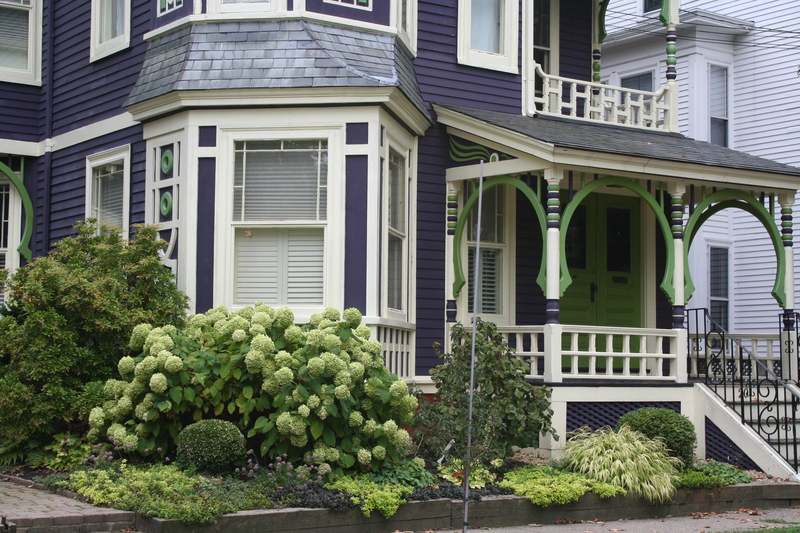 The deep purples and greens of that slate roof present a palette the homeowners can use for their house: rich grape for the siding color tempered by a neutral cream trim and lime green for the accent color to highlight the Victorian embellishments. But the homeowners did not stop there. To enhance the palette and spread the accent color out onto the landscape, they planted a gorgeous lime green Hydrangea coupled with other lime green plants, shrubs, and ground-cover species. Peeking out from under all that greenery is a purple flowering ground color pulling the whole look together. Not to be matchy-matchy or anything, but this house rocks. There’s just enough contrast to keep our interest and show off the house detail without introducing new colors that might make the house too busy. Afterall, the house itself has so much detail that you wouldn’t want it to get lost in a rainbow of foundation plantings and annuals. Dark blue-green pine needles and rich cedar mulch present a warm house color palette perfect for homes that want to sit quietly in a wooded environment or at least conjure up the same. Although much of the leafy countryside in many landscapes is a mixture of greens, notice that most have a yellow undertone. But not pine green. It leans more toward blue and for that reason can really stand out in a grove of maple trees. To warm up the cool green shade, add brown and no better place than the roof (a gray roof is fine too but it will keep the house cool). Creamy trim provides contrast between the two darker shades and serves to outline the architectural detail (dark trim will get lost but use it if you are seeking camouflage). For the front door, why not splurge and get solid wood stained a darker version of the roof color or choose a similar paint hue like Maple Syrup (Ben Moore 1105). Black wrought iron is the best metal for hardware, lighting and accessories. Once again, nature’s palette does all the work.